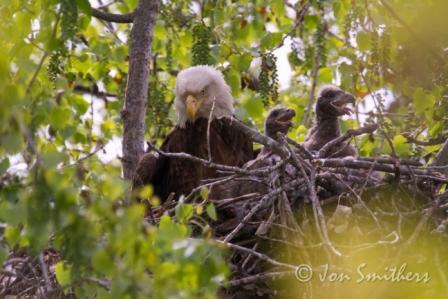 Jon Smithers, photographer and friend of TRC, was able to photograph a USFWS (federal) band on a bald eagle with a nest that he had been observing. The bird is one that TRC banded as a nestling in 1998. It had fallen out of the nest (in Chaska) and had a broken pelvis. Since pelvic fractures heal best with "bed rest" and young chicks heal fractures at an amazing rate, TRC rebuilt the nest and returned it to its parents. With tincture of time, good feeding by its parents and a safer nest situation, it obviously thrived! 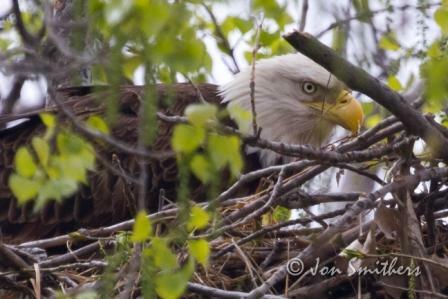 This bird is now a successful adult as you can see from these pictures taken May 7 this year. Jon has a couple of videos on YouTube that he also filmed here (where you can see the bird's band) and here. Unbelieveable! I remember when that happened as I was living in an area near that nest, and he was featured in the local paper. I had forgotten all about it though. That is a wonderful story with an even better outcome! Thanks TRC!! What a great follow up! I was the person who called the MnDNR and TRC. The eagles had built their nest about 80 feet up in a dead tree near the M. A. Gedney Company and we had been watching the progress of the growth of the two eaglets. They were big but could not branch yet when the big storm of May 1998 took the nest down. We saw the parents circling the area and called TRC. TRC came out and found both birds. One died from its injuries but the other went to TRC for a few days. A large fan guard was laced with willows and placed back in the tree. The eaglet was then placed back in the nest and we all waited two agonizing days to see if the parents would feed her. Finally we saw a parent bring a snake to the nest and the rest is history. Thanks TRC for being there!